©IFS August 2016 – Reposting and/or translation of this article is strictly prohibited. Daisuke Takahashi broke the news of his retirement from competitive skating at a press conference in Okayama, Japan, in October 2014. He said he was moving to the United States to search for a new goal in life. But that was only part of the story. Skating had been a central part of his life for 20 years, but the Japanese star was burnt out and needed a change. He quietly stepped away from the limelight without any further fanfare. The 2014 Olympic season had been a struggle for Daisuke Takahashi. He finished fourth at 2013 Skate America, before bouncing back to win NHK the following month. He qualified for the 2013-2014 Grand Prix Final, but was forced to pull out due to a leg injury. At Japanese nationals, he placed fifth overall but was assigned to the Japanese Olympic team. In Sochi, there was more disappointment with a sixth-place result. After withdrawing from the World Championships the following month, Takahashi was left pondering his next move. “That season I did not want to work at all. I went away because I wanted some time for myself. If I am being honest, that is the reason I gave in order to escape,” he admitted with a sheepish laugh. “It had come to the point where I really did not know if I even wanted to skate anymore. If I’m not motivated to do something, I cannot do it. So I felt that skating in public when I was in that frame of mind would be disrespectful. “For about six months prior to announcing my retirement, from the Olympics until October of that year, I really did not want to skate at all. I appeared in shows, but that was only because I had agreed to do so already. I kept thinking during that time, ‘What am I skating for if my heart is not in it?’ I was trying my hardest, but I felt that it was not right to continue in that state of mind. When Takahashi moved to Long Island, N.Y., to study English in April 2015, he did not pack his skates. “I did not skate at all when I was living in the U.S. When I went back to Japan to skate in shows, I had no choice but to skate again, even though I did not really want to,” he said. With the passage of time, he has become more philosophical about not accomplishing that ultimate goal. “I was not able to be the first Japanese man to get an Olympic gold medal, but the experience I had in Sochi was so valuable. Not getting the result I wanted was fate. If I had won gold in Sochi, even if I had continued skating afterwards, I think I would have just stopped at an early stage. As figure skating has grown in popularity in Japan, many of the new generation of skaters consider Takahashi and his style of skating an inspiration. He is genuinely puzzled, though, when he hears that younger skaters aspire to be like him. “It makes me happy, but I think there are other people more talented than me. It would be better to aspire to be like someone else more talented,’ he said with a laugh. “I have never really looked at my own skating, so I suppose I cannot say anything. “I do not think there is anything special about me, but everyone tells me that when they think of ‘Daisuke Takahashi’ my step sequences come to mind, so I am pleased because it makes people happy. Artistic expression is really subjective, isn’t it? You like what you like and you don’t like what you don’t like.” Shoma Uno is one of the skaters who has publicly expressed the influence Takahashi has had on his skating. Takahashi has been watching the progress of the 2015 World Junior champion. When asked if he has any words of wisdom for the teenager, he said his only hope is that Uno continues to develop his individuality. “I do not really have any advice for him. As he grows older and experiences lots of things, he will find that his range of expression will widen. It is a matter of not taking things too seriously. That is probably the advice I would give. Living spontaneously broadens your horizons. If you become too serious, your range of expression becomes too narrow. At age 30, Takahashi now has set his sights on new challenges. He will be a guest performer in “Love on the Floor,” a dancing extravaganza created and produced by two-time “Dancing with the Stars” champion Cheryl Burke. Takahashi took some dance classes while he was living in the U.S., but said this would be a new experience. Takahashi is also stepping into the world of television. This summer he worked as a commentator for Fuji TV at the Summer Olympic Games in Rio de Janiero. 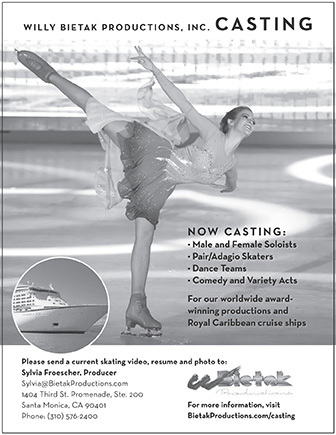 Starting next season, he will cover figure skating for the network as a live commentator and conduct one-on-one interviews at Japanese nationals, Four Continents and the World Championships. But he is now certain that skating will continue to be part of whatever he does in the future. “As a skater, my big, vague dream is to produce a high quality ice show that tours Japan; a show where people come not to see a certain skater, but to see the show itself. He credits Nagamitsu for pushing him to make it as far as he did. “She demanded more of me than I ever did of myself. She believed that I could do it more than I did,” he said. Takahashi said his only wish for Asada is that when the day comes for her to retire she has no regrets.